No matter what type of your residential or office space is, you probably have some rooms with a tile floor. With the aim to help you to make your life better, we devoted ourselves to investigate more than dozen best vacuum cleaners for tile floors – for your best choice. Today it’s almost absurd to think about a vacuum cleaner that has no more options, so you might be interested to know to which features you should particularly pay attention. Given that most of the vacuums are, so to say – multitasking, it seems logical and expected that every vacuum cleaner is capable to clean tile floor, but that’s not true. Also, as the tile floor is solid and durable material, it may seem that is very easy to clean it. I mean, you can see any dirt and easily pick it up ie. remove with the vacuum. It is also not true. You can see, but your vacuum cleaner may not be able to vacuum all the debris. We have to say that many vacuums on the market are not very effective in removing all of the dirt that we find on tile floor every day. Unfortunately, some of them will not cleanse the dirt, but there is a possibility to damage your tile floor. There are some essential things you should think about before you decide to purchase, and we will help you to make the right selection. Look at their individual characteristics, and whichever you choose, you will not make a mistake. I’m sure that among these five best ones, one is for you. The Dyson DC25 is a well-equipped vacuum, with a strong motor (1,200-watt). 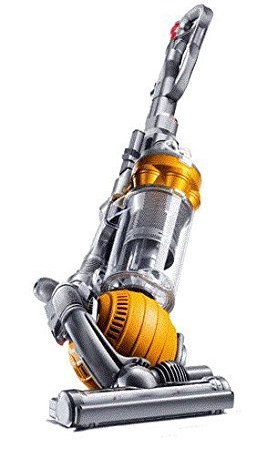 A powerful Root Cyclone technology patented by Dyson gives to this machine remarkable suction capability. High turning speed of brush bar allows easily removing of pet hair from carpets, but if you turn off the brush bar, you will get gentle vacuuming of delicate floor coverings, such a tile floors. This vacuum is also equipped with a HEPA (high-efficiency particulate air) filter. It has the capability to capture tiny particles. That way all kinds of dirt, microbes and potential allergens don’t remain in the air. The HEPA filter keeps the air clean. The filter is washable! Because of this extraordinary filtration, the Asthma and Allergy Foundation of America has awarded Dyson its patented “asthma and allergy friendly” certification. The somewhat unusual way of moving this vacuum may take you some time to get used to it, but you’ll see it’s worth it. One of the unique qualities of this upright vacuum actually is the fact that it moves around on a ball instead of four wheels. This ball technology of moving allows handling and easy working on all surfaces of the floors. The canister bin can hold one-third of a gallon of debris. Emptying the bin is quick and simple. With the 16-foot “quick draw” telescope wand no surfaces in your home are beyond the reach of this vacuum. When comes to accessories, some users have complaints that the attachments are a bit clumsy. Generally, this vacuum is a very solid product with excellent customer ratings. While most of the vacuums struggle to reach the edges, this Bissell vacuum with its arrow-shaped cleaning head has no such problem. It is impossible not to notice its remarkable effectiveness at cleaning larger debris, but it struggles with smaller. Yet, customers say that in daily maintenance of hard floors it makes wonders. Its design offers you edge-to-edge cleaning. What this vacuum make even more impressive, it is able to pick up pet hair better than most other vacuum cleaners, especially on hard and tile floors. The unique head of this vacuum allows vacuuming around the furniture, so the moving is needless. It means also that there is a less of a chance to damage your floor by moving the furniture. Customer reports are that flour and fine dust are cleaned weaker, i.e. it is necessary to pass through with other appliances, but it is excellent for cleaning of larger debris that we often find in the average home. It is a bit louder for its size. It also has no hose or accessories of any kind. You do not need to sweep after vacuuming. It is specifically designed to target pet hair. You do not need to move furniture to clean. The noise created by the motor may disturb some animals. The wheels can cause issues. Although somewhat limited compared to other similar products, this vacuum certainly has a solid place in the market. It seems that the model FH40010B is one of the best products under the Hoover brand. This wet/dry vacuum is designed to vacuum, mop and dry-clean – everything in one. It means that one machine can deal with all your needs and to eliminate the need for mops and scrub brushes. It even dries your tile floor. Along with its many other features, this is a vacuum that should be seriously taken into consideration. This SpinScrub model combines together vacuuming and mopping. It works as a strong floor vacuum, picking up food and dirt, and after that its mopping function washes and drying the floors. 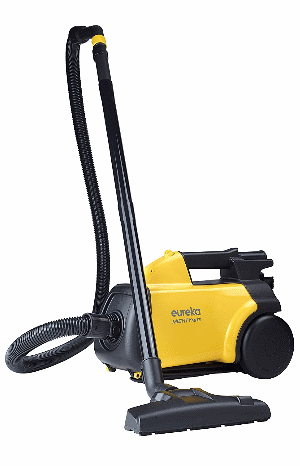 This vacuum is equipped with a bit less powerful motor compared to other models, but the brushes compensate it by the capability to pull particles from the floor. It has two containers that can be used for holding clean and dirty water. The washing function may be used only for hardwood and tile floors, not on multiple surfaces. Some users feel that this vacuum is good for light to medium mopping. The small tank for the water needs to be filled often, and the tank for the dirty water frequently emptied. There are also complaints that it is quite noisy. Offers vacuuming, mopping, and drying. Can be used on hardwood. Does not handle heavy-duty mopping jobs well. The tanks must be filled and emptied often. Overall, by its features, this is one of the better vacuum cleaners. Described as a 2-in-1 steam mop and vacuum, the BISSELL Symphony All-in-One Vacuum and Steam Mop is an excellent choice. With several other features, it could be ideal for cleaning bare floor surfaces, such as tile. It depends on the type of tiles and how high traffic the area is, but we think (as well as many of customers) that it works very well on any hard floors, including tile floor. Two-in-One, both a vacuum and a steam mop, this cleaner will save your time as well make the work easier. Since the controls are digital, accessible through easy touch, it is very easy to use. It does not use chemicals, but sanitizing with steam, and capable to eliminate 99.9% bacteria and germs. It has 4 mop pads, which will need to be replaced at times. These wash pads are reusable and washable. With the weight of only 10 pounds, this combo cleaner is lighter compared to other modern vacuum cleaners. If you have a tile with unsealed grout, this vacuum is not effective. Its biggest problem is that there is no switch to turn it on and off; once you plug it in, it is on until you unplug it again. Eliminates the need for mopping separately. Not good if your tile has unsealed grout. No On and Off switch. 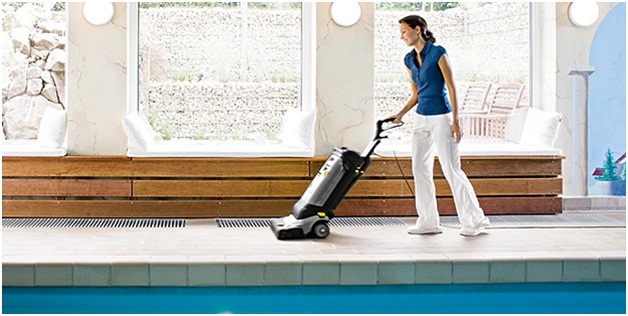 Its features make it one of the best vacuums, giving it a significant place in this list. Another one vacuum designed for use on multiple surfaces; all you need to do is to change out attachments. Its blower port allows you even to clean out the garage. The suction capability of this model is strong. The vacuum uses dirtbags that hold up to 96 ounces, what greatly reduce the frequency of replacement. The bags are easy to remove and contain the dust and particles well. It is a canister vacuum, so you can manually adjust the height of the suction piece from the floor. That is particularly important since this hard floor vacuum does not have adjustable suction settings. The canister is easy to empty, making it all around a great contender for most homes with tile floors. With a dusting brush, a tool for cracks and an extension wand, with this vacuum, you can clean most areas. A great advantage of this model is its weight – less than 9 pounds, what makes it easy to carry up and down the stairs. 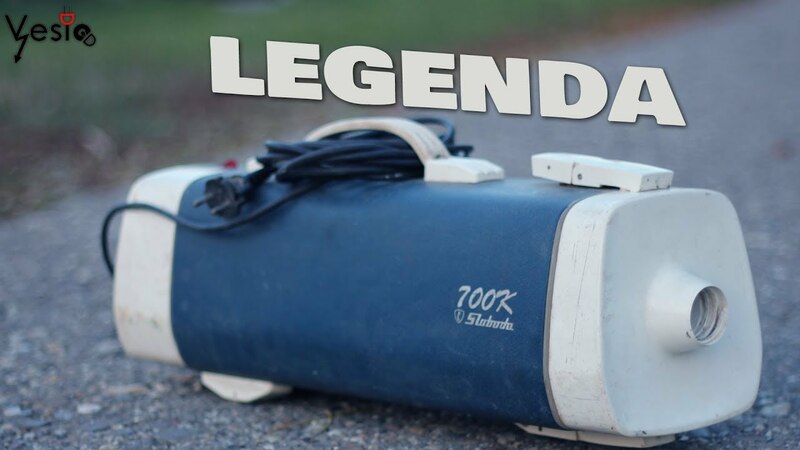 The motor of this vacuum is a high-powered, but also louder compared to other models. Many users feel the cord is too short and must repeatedly plug and unplug. It seems that the biggest problem is the hose. When first purchased, it is quite stiff. Over time it can develop kinks that weaken the suction of the vacuum. Works on multiple surface types. A hose can produce kinks. With its distinctive benefits, this vacuum is worthy of good consideration. What’s your home as a whole (or: how you want it to be)? Although at first glance it may seem excessive, I think it’s important to imagine your home, with everyone living in it: with furniture, things, children, pets, plants. Imagine all of them (and all of that) on your tile floor. What are your habits: the time for meals, the frequency of motion – what usually remains on the floor? Believe me, this will help you choose when to purchase! Do you have both of the predominant two types – glazed and quarry ceramic tiles? The glazed tiles don’t retain dirt and are easy to clean. Unglazed tiles retain more dirt, between wrinkles, are more difficult to maintain and therefore you may need a more powerful vacuum cleaner. While the beater brush is required and indispensable for pulling the dirt out of the carpet, it could make problems on the tile floor. Its sharp bristles can cause damage on your floor, especially on unglazed tiles. You may conclude it’s better than have a vacuum without a beater brush. On the other hand, you might want to have a retractable beater brush. For many, this is a very important feature. Depending on the type of floor, you have the ON/OFF option. This can be a solution to the problem from the previous paragraph. You cannot always rely on a brush, especially when it comes to the tile floor. Therefore, your vacuum cleaner should have a powerful suction capability. It’s particularly important if your floor or some of its parts is made of unglazed tiles, which have a tendency to retain dirt among the unevenness. Every vacuum, regardless of the type and purpose, has a filtration system. When it comes to the tile floor, that system should be perfect. You might wonder why? Tile floor accumulates electrostatic dust and: dirt and debris remain in the air. So, you need a vacuum that allows full suction and filtration. Both types can work well. It is up to you, to assess what kind of cleaning is the best to you, your family and home. Tile floor by itself is mostly slippery, especially glazed. So, you need a vacuum with wheels that do not slip. Controlling the handling of the appliance may be difficult if the wheels are sliding. The best solution is rubber wheels, but you also can find plastic wheels with a non-slip coating. Plastic wheels alone are not a good choice. When I was a girl, cleaning and wiping the floors meant: wear old clothes, take a broom, a dustpan, a bucket with water, a lot of clothes (come on, there were no mops!). Then, roll up your sleeves and get to work! When my mother bought the first vacuum cleaner… I think it is pointless to continue with this story, I sound myself like I’m 250 years old. Still, it’s not quite pointless. I want to say something that someone smarter than me already said: “What was once a solution, has now become a problem”. So, I find myself writing about top 10 and top 5 vacuum cleaners, and not for any floor, but particularly for tile floors. And why my final choice is Dyson DC25 – Ball All-Floors Upright Vacuum Cleaner? Remember my advice at the beginning of this article: “Imagine your home”. While I was researching and comparing, as I said more than dozen different models, all the time I imagined my home and my needs in it. I have a big house, many stairs, a dog, a cat. I have adult children and little grandchildren, who visit me occasionally. I have carpets and several rooms with tiles. I’m a lady who knows all the elements necessary to maintain a complex home.